This version of this famous Islay whisky has been aged in three different types of cask. Like the Quarter Cask, it begins life in American oak casks that have already been used for bourbon whiskey. Part of this spirit is then selected and transferred into quarter casks for a second maturation. It is then transferred a second time, this time into casks that have previously held oloroso sherry. This triple maturation creates a balanced whisky with notes of peat, wood and sherry. After a certain time determined according to the needs of each whisky, it is diluted with water to 48% and bottled without chill-filtration. 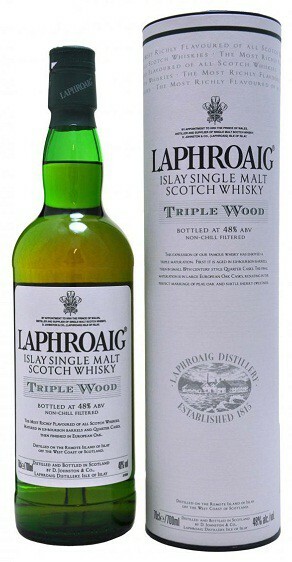 A special expression of the Laphroaig single malt, Triple Wood is younger, stronger and richer in taste than its older brothers. This is the perfect whisky for fans of un-chillfiltered, peaty single malts. Die-hard Islay fans will not be disappointed.